In case you haven’t noticed, we love cookies in this house. So, when we had a snow day this week and I suggested we make bake, the kiddo wanted to make cut-out cookies. *sigh* I’ve mentioned before what I think of cut-outs. But, I’m a good momma, though, so I indulged him. But, like me, he gets weird ideas in his head. And, on this particular day, he wanted to make cut out peanut butter cookies. I explained that peanut butter cookies aren’t typically done cut-out style, but we could probably come up with some concoction that worked. So, we got out the bowls and the measuring cups and started in on our concoction. Here’s how Kiddo recipe development works. We start with some basic measurement – in this case 1/2 a cup of softened coconut oil. Then, we determine what kind of sweetener we want to use. Palm sugar seemed appropriate for a cut-out, since we needed a dryer dough than dates would afford. Flax egg is standard in any cookie recipe, the only question is, one or two? Two seemed good today. Next up, flours. Here’s where we start to taste and adjust. We started with almond meal, cocoa and 1/2 a cup of peanut flour. Then we tasted. We knew we needed more dry ingredients before tasting, but we had to decide what. “More peanutty!” declared the kiddo. So, we doubled the peanut flour, and decided coconut flour would give us the best cut-out texture. In it went, bit by bit until we got the “right” texture. And there you have it. 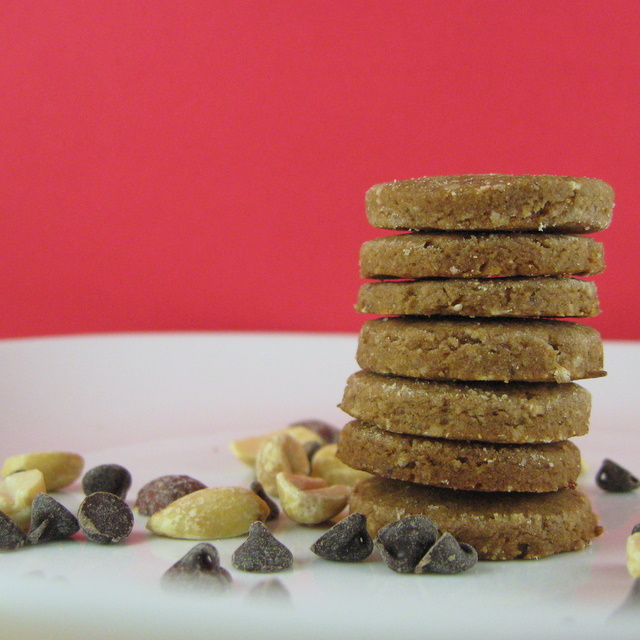 An easy to work with, reasonably good for you, choco nut cut out cookie. And, shhhh…. I actually kind of like this one. In a large bowl, beat the coconut oil until creamy. Cream in the sugar. Add the flax egg and beat until light and fluffy. Add the rest of the ingredients and beat until a smooth dough forms. Divide dough into 2 balls. Roll out one ball to 1/4 inch thickness between 2 sheets of parchment paper. Dipping cookie cutters in coconut flour, cut out shapes and place shapes on parchment-lined cookie sheets. These don’t spread, so feel free to place them fairly close together. Bake for 7 to 10 minutes. Repeat with second ball of dough. If you chill this dough, the coconut oil will become too hard to roll out and you’ll need to let it soften again before rolling them out. For more slightly indulgent goodies, check out Slightly Indulgent Tuesdays. For more gluten-free goodies, check out Gluten-Free Wednesdays. 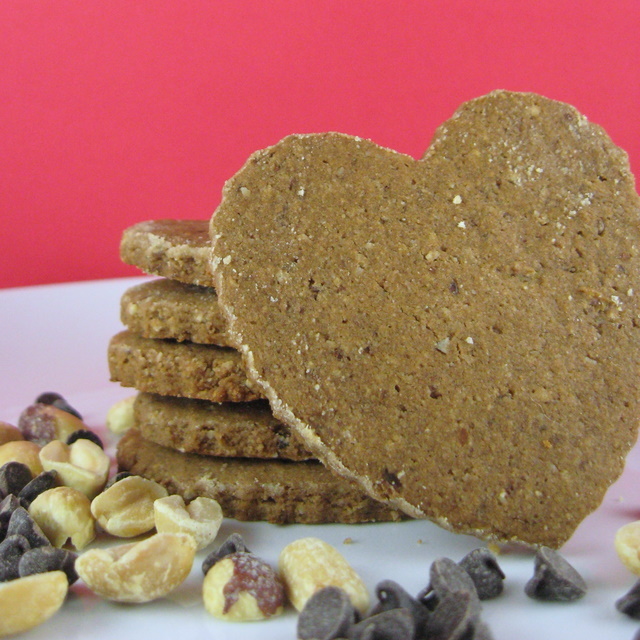 This entry was posted in chocolate, coconut, cookies, grain-free, nuts, vegan and tagged chocolate, cookies, gluten-free, grain-free, peanut, recipe, Valentines, vegan. Bookmark the permalink. Thanks Shirley. I love letting people know that baking doesn’t have to be so scary and precise. I rarely follow a recipe 100% and once you have a feel for what a certain type of dough should be like, it’s easy to play around with ingredients. These look so cute and healthy, too!! Love it! I love the process that you followed to make these! I’m starting to get more comfortable with not having to follow a recipe so strictly, so maybe I’ll try this next time I make cookies! Cookies really are the easiest baked good to mess around with. You might end up with a different texture – spreading cookies versus not spreading, puffy versus flat. But, you have to go pretty far afield to wind up with something that isn’t edible. And, it’s a great experiment for the kiddos. It’s sometimes fun to bake off a batch you know won’t work the way you want it to, and then talk about what you could do to fix it before you bake another batch, too. What a wonderful and natural way to teach the hows and whys of baking! Anything with peanut flour and chocolate is good and I love the combination of almond and coconut flours. I’ll look forward to trying this one, too. I loooove cookies! Peanut butter cut-outs? Why not! That boy is genius with ideas, seriously. Thanks Kayla – I’m always happy to provide recipes for other folks with restricted diets! I love your gf & vegan cut out cookies a lot & I have more than 120 cookie cutters so I will be using them for this tasty recipe!! I also love coconut oil & coconut flour a lot!! Wow! That’s a lot of cookie cutters! I’m jealous. I hope you like this cut-out recipe and it makes good use of that cookie cutter collection. Oh, these look so fabulous, and I really want to make them, but we have no peanut flour in Australia. I did just buy coconut flour for the first time… maybe I could up the coconut four and stir in some peanut butter? Hm… peanut flour is defatted – so I’m not sure just stirring in peanut butter would work. I think what I would do is try reducing the coconut oil by half and adding an equal portion of peanut butter – the thicker the better. You may need to adjust the other flours a bit to get a dough that’s rolling out consistency. I’d actually thought of trying it that way as well. But, haven’t done it yet. I’ll let you know if I do. Let me know if you do, too, okay?